The installation of MyFig bus platforms near USC is underway! 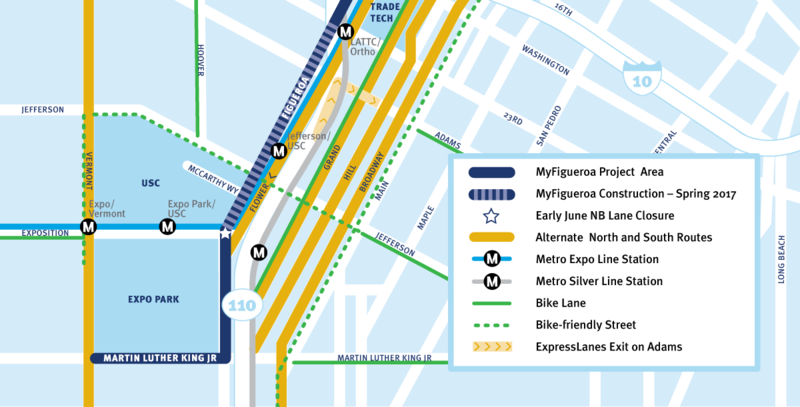 As contractors work to install the bus pad at Figueroa and Exposition, north-bound Figueroa will be temporarily limited to one lane of traffic in early June. From approximately 9:00am on Friday June 2 until 6:00am on Monday June 5, north-bound traffic on Figueroa will be reduced to a single lane at Exposition Blvd. LADOT is doing everything in its power to minimize the impact of this work, and workers will be using a quicker drying concrete to reduce the time of this closure. On the east side of Figueroa contractors continue work on the five bus platforms between Exposition Blvd. and 23rd St, including the completion of four of the five sidewalk ramps this past week. Contractors have also been prepping the five locations of the bus platforms this week, and on Friday and Saturday they will be pouring the framing of the platforms. We will soon start to see what Figueroa will look like with MyFig complete! Next weekend, contractors install the new bus pad at Exposition mentioned above, and the other four bus pads will follow – but these will not involve additional lane closures. In the meantime, contractors have set up the temporary traffic signal poles to allow removal of the old ones. Contractors will begin installing new permanent signal poles over the next few weeks. Stay tuned as MyFigueroa construction moves along, and check out our twitter, facebook, and instagram for further updates!